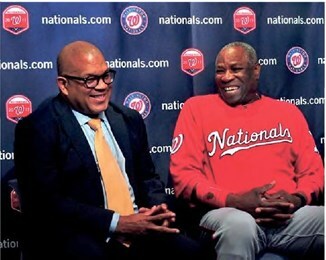 WEST PALM BEACH, Fla. – It’s Black History Month, and Major League Baseball Manager, Dusty Baker, has personally lived through black history —and American history as well. The Washington Nationals manager is now back in West Palm Beach for his club’s new Spring Training Home off Military Trail and Haverhill Blvd. But the Skipper recalls a time when he was not allowed to stay at the nice hotels on one of the city’s major thoroughfares, Palm Beach Lakes Blvd. In an exclusive interview at the new ballpark this week with the South Florida Times, Baker recalls facing blatant racism during segregation as a young player here in Palm Beach County during the 1960’s. “It brought me to tears as a young 19-year-old. But in the end, it made me a better man, a stronger person and I grew from that experience,” he recalled of that painful period. He even said he told his mother that he wanted to come back home, but she told him to tough it out. It was also during that time, when he happened upon a family that was hosting one of his teammates. That happened to be the family of now, Attorney Richard Ryles, a prominent West Palm Beach attorney, who was but a toddler at the time that Baker frequented the Ryles home daily to visit his teammate. “Of course now he’s known as ‘Attorney Ryles,’ but back then, he was known as ‘Little’ Richard. He went everywhere with us. We went fishing and did so many things. He was just a little one at the time,” recalled Baker, sitting next to Ryles during the interview. The two recalled a special bond formulated between families that lasts to this day, over 45 years later. And during this recent visit when Ryles showed Corey Bell Baker his law office, Baker was astounded. “I am so proud of him! An attorney! I told him that even I don’t have a building with my name on it!” The two laughed. Baker and Ryles mused at how life has evolved for both men. Ryles, now a partner with Rosenthal, Levy, Simon and Ryles, has been an attorney for 27 years. He’s also a local leader, who isn’t afraid to speak out on civic and economic issues throughout the county. And it’s no secret Baker has had an incredulous life in professional baseball, now back in West Palm Beach as head of the Washington Nationals. He enjoyed a 19year career as a hard-hitting outfielder, primarily with the Atlanta Braves and Los Angeles Dodgers. He helped the Dodgers to pennants in 1977 and 1978 and to the World Series championship in 1981. He then enjoyed a 20-year career as a manager with the San Francisco Giants, Chicago Cubs, Cincinnati Reds, and now the Washington Nationals. Life truly has evolved from the days of segregation. And like many others, there was a moment in history that he’ll always cherish. Baker said he was naturally inspired, proud and overjoyed to see a personal friend become the first African American president of the United States. “I helped President Barack Obama campaign. I’m proud to say he is a friend whom I knew before he became President, I knew him when he was a senator,” Baker quipped. Despite his storied career in professional baseball, Baker said there was a time when he wanted nothing to do with the sport any longer. But, as a man with a strong faith, he prayed for answers on his new career path, but somehow landed back in the game. “That’s how I live my life. I pray,” he said, as the interview concluded.